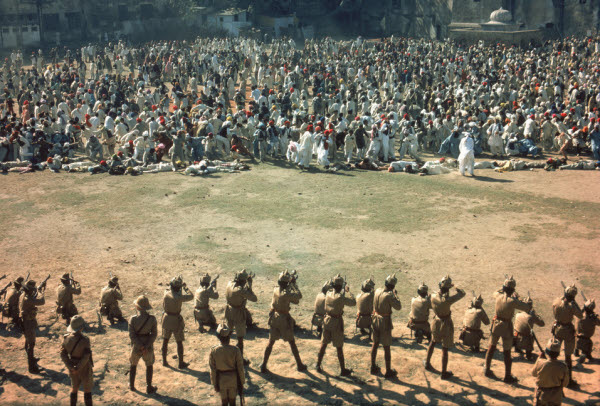 GANDHI, Richard Attenborough’s reverential 191-minute epic 1982 biopic, is likely the only history lesson most people outside India will ever get about the little man who did so much, with so little, for so many. He didn’t bring down the British Empire on his own, but his slight shoulders gave it one mighty push. From the firmness of youth to the frailty of old age, director Attenborough covers highlights of the Great Soul’s pursuit of justice, rather deftly avoiding elements of the Mahatma’s story that might tarnish the tone. The first half is quite good, the second slows, sometimes getting close to a respectful yawn. As a producer, Attenborough put 20 years of effort to work on a mammoth scale, with marvelously evocative location work in India featuring literally countless extras—in one scene he set the World Record as 300,000 people showed up for the funeral procession re-enactment. Hunger strikes and speeches about compassion and policy framing make for dicey cinema (try sitting through Exodus without looking at the clock) but scenic train journeys, vicious riots and appalling massacres keep the viewer focused on the narrative need for the former. The movie is more dutiful than exciting, and it’s rarely as moving as it wants to be, more like a tableaux than a tempest. Still, an astounding feat, benefitting immeasurably by the fortuitous casting of Ben Kingsley. 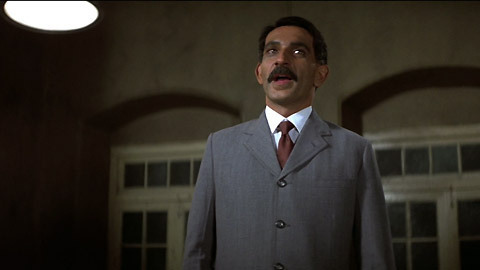 Aside from the fact that he’s a wonderful actor, Kingsley’s ringer resemblance (and gift as a mimic) likely got his Best Actor Oscar away from Paul Newman, possibly even better in The Verdict, and with some irony, from Dustin Hoffmann’s Tootsie, as Hoffmann expressed interest in the Gandhi role but opted for the comedy instead. Adding to his coup is the fact that stage-actor Kingsley had only appeared in one other film, ten years earlier. This is what is known as hitting one out of the park (or the cricket equivalent). 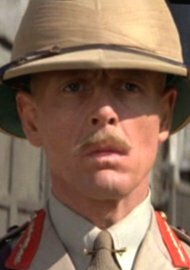 Kingsley’s galvanizing center is buoyed by a slew of aced-across star cameos from John Mills, John Gielgud, Martin Sheen, Candice Bergen, Trevor Howard and Ian Charleston, with a particularly chilling pass from Edward Fox as an ice-eyed, mercy-free general. Flanking Kingsley and the Anglo stars is a likewise superb lineup of Indian actors–Saeed Jeffrey, Roshan Seth, Rohini Hattangadi. Along with the star, it swept up another seven Oscars, deserving its wins for Best Picture, Cinematography and Costume Design; less so Director (I’d give it to Wolfgang Peterson for Das Boot), Script (root for Tootsie), Editing (Das Boot shreds it) and Art Direction (Blade Runner, without a doubt). 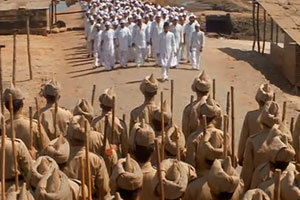 Ravi Shankar’s excellent score lost to John Williams sappy overkill for E.T. (Williams and Spielberg driving ain’t-that-sweet hokiness into orbit). Sound Mixing and Makeup were also nominated. The $22,000,000 outlay recouped six times that worldwide, with generally rhapsodic reviews. After that initial applause it’s been relegated, due to its pace and length, to kind of a once-every-decade dutiful-watch on the order of other Big Important Winners like Amadeus (if I hear that laugh one more time!) or Dances With Wolves (thank Great Spirit he met a New Age white woman). The importance of Gandhi’s story and message and the many successful components of the production absorb and defuse critique. With Ian Bannen, Nigel Hawthorne, Michael Hordern . Look for bits by Bernard Hill, John Ratzenberger and a 25-year-old punk named Daniel Day Lewis. For a fascinating read, dive into “Gandhi and Churchill: The Epic Rivalry That Destroyed An Empire And Forged Our Age”, by Arthur L. Herman.